The National September 11 Memorial & Museum– recently opened in the footprints of the World Trade Center in Lower Manhattan– is an educational and historical institution honoring victims of both the 9/11 terrorist attacks and the 1993 bombing, while examining 9/11 and its continued global significance. The National September 11 Memorial & MuseumThe National September 11 Memorial & Museum is the not-for-profit corporation created to oversee the design, fundraising, programming and operations of the Memorial and Museum. The Memorial and Museum are located on eight of the 16 acres of the World Trade Center site. The Memorial remembers and honors the 2,983 people who were killed in the horrific attacks of September 11, 2001 and February 26, 1993. 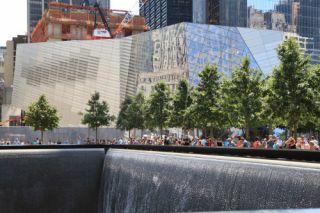 The design, created by Michael Arad and Peter Walker, consists of two reflecting pools formed in the footprints of the original Twin Towers and a plaza of trees. The Museum displays monumental artifacts linked to the events of 9/11, while presenting intimate stories of loss, compassion, reckoning and recovery that are central to telling the story of the 2001 and 1993 attacks and the aftermath. It also explores the global impact of 9/11 and its continuing significance. Davis Brody Bond are the architects of the belowground Museum and Snøhetta designed its entry pavilion. The Museum’s exhibition designers include Thinc, Local Projects and Layman Design. Electrosonic provided the audio-visual systems for the museum, which is primarily located about 70-feet below ground and offers a unique and moving visitor experience. "Electrosonic supplied a traditional museum system for the exhibition space where approximately 100 media experiences are available for visitors." Seven Sharp projectors display the approximately 11-minute video on three walls that surround visitors. A full EAW sound system delivers the audio. “We built a full-scale replica of the room in our Burbank facility and tested a variety of content in it,” Benedict reports. (Photo by Jin Lee. )Electrosonic created full-scale mock-ups of about 70 percent of the exhibits at some point in time. “We did a lot of testing with Design & Production near Washington, D.C., Hadley Exhibits in Buffalo and our own facility in Burbank,” adds Electrosonic account executive Bryan Abelowitz. Since the Last Column, a 36-foot steel piece from the Twin Towers, is so tall, two 55-inch ELO touch screens run Local Projects’ interactive software, allowing visitors to scroll up and down its full length to see high-resolution details of the signatures and mementoes on its sides. (Photo by Jin Lee. )Electrosonic also provided a full AV system for the multi-purpose Pavilion auditorium, an approximately 150-seat theater used to show videos throughout the day and available for hosting events from standard presentations to video conferences. The Pavilion auditorium has its own control room with two racks. Each education classroom is self-contained. Electrosonic is providing two on-site technicians to help keep the museum’s exhibits in good order.